View More In Espresso Cups - Page 2. 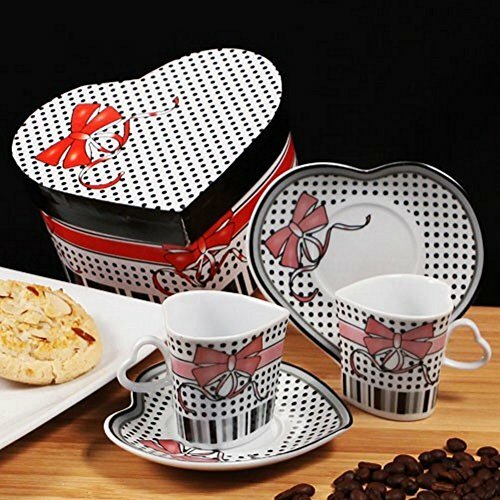 Each porcelain espresso set features a pair of heart shaped cups and saucers decorated with a Red Bow design. Each Set is packaged in a matching heart shaped box all ready to gift. Give a fantastic gift for coffee lovers. Measures Cups 2in.D x 2in.H, Saucers 4 1/4in.D. Each espresso cup holds approximately 2 oz of liquid. Comes in an elegant heart shaped gift box. Box measures 6in.L x 5in.W x 3.5in.H. If you have any questions about this product by R & B, contact us by completing and submitting the form below. If you are looking for a specif part number, please include it with your message.